The desire to reverse the signs of facial aging becomes highly desired as adults begin to witness the creeping transformation caused by the breakdown of their skin quality. While facial changes are a natural part of the aging process, it’s not a part that needs to be accepted. Reversing the signs of aging is becoming easier than ever before as cosmetic surgeons are perfecting their techniques to provide you with natural-looking, youthful transformations. Eventually, everyone can expect to experience aging throughout all areas of the face, but the area around the eyes and the upper face tend to change at an expedited rate. Considering that you blink thousands of times a day, your forehead moves with every expression you give, and that the skin around this area is naturally thin, this fact should come as no surprise. The appropriate way to address these issues surgically comes down to the specific cause of the aging symptoms, which can often be difficult to identify. Most patients see sagging skin and puffy eyes and automatically assume that the skin on their eyelids is to blame for their aged appearance. While this may be true in some cases, the real culprit is often the skin near the eyebrows. Dr. Calabria can help put you on the right course of action after your consultation, here is an overview of how to identify the root of your aging concern. Skin laxity on both the eyelids is prevalent as we age. Unfortunately, this laxity causes both aesthetic and functional concerns. As the skin becomes lax, it droops down towards the eye and can eventually interfere with your field of vision. Eyelid surgery, also known as blepharoplasty, is designed to address the aging of the eyelids. This can be performed on both the upper and lower eyelid to remove excess skin and pockets of fat that contribute to droopiness, puffiness, and sagging of the skin. Patients in need of blepharoplasty have excess skin on the lids themselves but still have skin elasticity in their forehead and their brow. If your eyebrows are at the same level on your face as they were when you were younger, your eyelids are likely responsible for your aged appearance. Patients commonly mistake aging eyebrows for aging eyelids. This is because the visible symptoms of an aging forehead are the same as upper eyelid laxity. As the skin breaks down on the forehead, the skin, tissue, and muscles begin to droop, which puts an extreme amount of weight on the eyes. Since the skin on the eyelids is weaker than most other skin, it cannot withstand the added weight from the weakening forehead and brow areas, which is the culprit behind eyelid sagging. A brow lift raises and tightens the skin and underlying muscle on the forehead and brows to give you a refreshed and revitalized facial appearance. 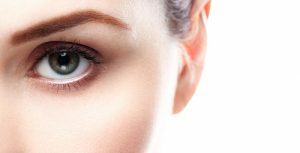 While some patients’ facial laxity comes down to either the eyelids or brows, many patients can benefit from combining both eyelid surgery and a brow lift. If your facial aging is due to both skin laxity on the forehead and skin laxity around the eyes, performing one without the other may actually backfire in the end since it will bring more attention to the area that is not being altered. 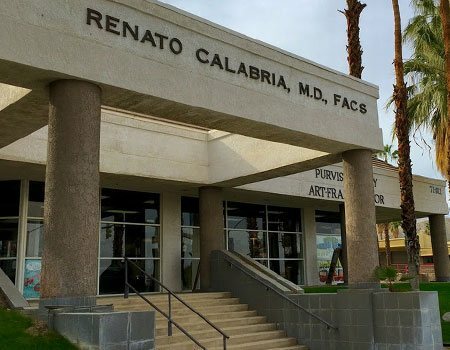 To learn more about blepharoplasty or brow lift surgery, contact Dr. Calabria’s Rancho Mirage office today at 760-836-0077.